Lexapro, or escitalopram, is a selective serotonin reuptake inhibitor (SSRI). Though the exact mechanisms of depression are not known, it is believed that depression can be treated by altering the chemicals in the brain. Serotonin is a chemical in the brain that is believed to ease depression. SSRIs increase available serotonin in the brain by blocking the reabsorption of this chemical. Manufactured by Forest Pharmaceuticals, this drug is available in either liquid or tablet form and has only been approved for use in adults. 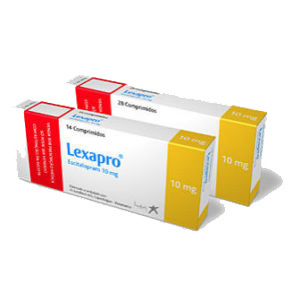 Lexapro and other escitalopram medications are used to treat depression and anxiety. Lexapro can be used on both adults and adolescents 12 and older for depression. It can be used on adults for anxiety. Escitalopram medications such as Lexapro work best when used in conjunction with other treatment options such as talk therapy. The dosage of Lexapro varies by individual, but the typical dosage for this medication is 10 mg daily. Some patients may be increased to 20 mg but this should be done gradually over time. Lexapro is available in both pill and liquid form. Some off-label uses for Lexapro include using it to treat migraines and symptoms of obsessive-compulsive disorder. Although Lexapro has the ability to boost serotonin levels in the brain, the exact way that it treats the symptoms of depression in patients is not completely understood. It is thought that by increasing serotonin levels, it may help to reduce the patient’s sensitivity levels to glutamate. Glutamate is the chemical in the body which is related to depression. By using Lexapro to increase the levels of serotonin, it may help to decrease activity in the part of the brain that leads to feelings of sadness and depression. The generic form of Lexapro is known as Escitalopram and it is produced by Teva Pharmaceuticals, Amneal Pharmaceuticals and Mylan Pharmaceuticals. Although a doctor may still prescribe Lexapro to patients suffering from these conditions, it is important that they be closely monitored in order to prevent possible interactions with other medications that the patient may be using. Patients should ensure that they drink sufficient amounts of water while using Lexapro in order to prevent dehydration.